For those women who are very tall, shopping for 38" to 40" inseam pants seems like a never-ending challenge. It's still going to be tough for sure, but I can hopefully help you out a little bit. After a lot of digging, I found a few stores offering super long lengths and below you will see my findings. I've also picked out some fashionable and popular pant styles that you may like. Again, see below. Most of them come in a 38" inseam. Those 39" inseams and 40" inseam pants are super tricky as you already know. If you want to browse some more on your own, keep scrolling to get to my store list. It's short, but there are a few options. I'm going to keep my eyes and ears open for any new shops that may pop up that sell these extra long lengths and will add them to this page right away. I hope you find what you're looking for! TALL TIP: Long Tall Sally has a great collection of 38" inseam pants. Check them out! You always get free shipping on orders of $30 or more ! 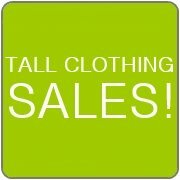 Long Tall Sally ($$) is a clothing store specializing in tall sizes. This will be the best place to find trendy styles of pants in a 38" inseam. They don't go any higher than that, though. They also have quite a few options of 38" inseam jeans that may interest you. LTS does have a few retail locations in the U.S., Canada, and the U.K., but shopping on their website will give you the best selection. And, to help you try things out, you'll get free shipping on a $30 purchase. Eshakti ($$) is a custom clothing shop that will get you the exact inseam you need and what I think is at a reasonable price. They have a pretty nice selection of pants and denim, all ready to be customized. You just provide your measurements, choose from a couple of style options, and there you have it! Alloy Apparel ($) often has a small collection of 39" inseam pants, typically more casual styles. They also have a few pairs of jeans in that length. If you see some designs you like, you'll get free shipping on a $100 order. Simply Tall ($$) is a tall specialty shop that offers ladies pants and jeans in 37" and 39" inseams. Their selection of 39" inseams is slim, but you still may be able to find something. Gap ($$) is a popular brand that you very likely already know about. They don't always have inseams over 36"-37", but every so often I'll see a 38" so I'm adding them to this list. Free shipping here on anything over $50.